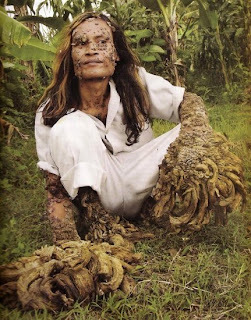 A 35 years Indonesian fisherman named Dede Koswara got a simple cut on his knee as a teenager and after that began growing tree-like welts all over his body. The welts soon became into mossy, branching growths. Dede was sacked from his job. His wife left him and he has been raising his two children. He was made into the village freak. To make ends meet he even joined a local "freak show", parading in front of a paying audience alongside victims of other peculiar diseases. Local doctors had no cure for his condition. But now an American dermatology expert who flew out to Dede's home village south of the capital Jakarta claims to have identified his condition, and proposed a treatment that could transform his life. After testing samples of the lesions and Dede's blood, Dr Anthony Gaspari concluded that his affliction is caused by the Human Papilloma Virus, a fairly common infection that usually causes small warts to develop on sufferers. His white blood suspected doctors that he may have the Aids virus, nut tests shoved that he did not and it became clear that his immune condition was something far rarer and more mysterious. Dede Koswara’s problem is that he has a rare genetic fault that impedes his immune system, meaning his body is unable to contain the warts. Dr Anthony Gaspari believes that Dede's condition can be largely cleared up by daily doses of a synthetic form of Vitamin A and several surgeries, which has been shown to stop the growth of warts. The doctor is also trying to get more American support for this special patient.